Nick Gordon has taken to social media once again with pleas to visit his girlfriend Bobbi Kristina Brown, who is currently in an induced coma with no clear recovery in sight. Gordon, who frequently uses his Twitter account to vent frustrations over the Brown and Houston families isolating him from his 21-year-old partner, invoked Bobbi Kristina’s late mother Whitney Houston on Thursday. Gordon has been banned from Bobbi Kristina’s bedside at Atlanta’s Emory University hospital since early February, attorneys for the 24-year-old previously confirmed. Representatives for Gordon, Bobbi Kristina’s father Bobby Brown and the Houston family have not yet returned TheWrap’s request for comment. “My heart is full of angry after the Browns have shut me out they don’t even know her. Sabotage,” he continued. Gordon is convinced his presence would improve Bobbi Kristina’s condition, which is murky at best considering a Tuesday attempt to bring her out of the induced coma rpeorteldy resulted in heavy seizures. 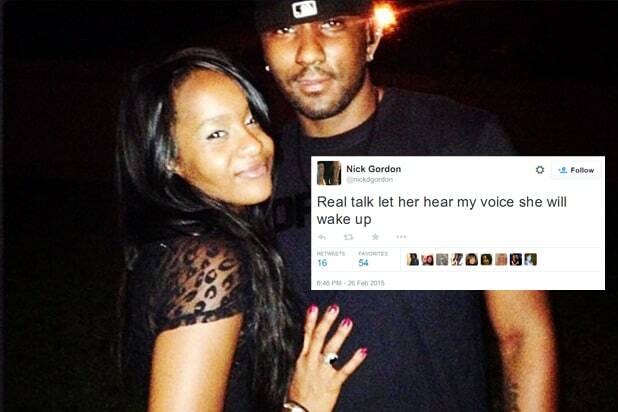 “Real talk let her hear my voice she will wake up, ” Gordon said. Unfortunately, a hospital visit from loved ones isn’t likely to change her comatose state. Doctors have yet to assess the damage caused when Bobbi Kristina was discovered unconscious, face down in her bathtub, as every time she’s been weaned off of drugs keeping her in a coma, the young woman reportedly suffers seizures. But the extent of the brain damage is difficult to determine when a patient is in a medically induced coma, making it a normal part of treatment to take the patient out of the coma to assess his or her condition more accurately. But Dr. Taban said that the seizures reportedly suffered by Bobbi Kristina when she was taken out of the coma could damage potentially viable brain cells. Reports that she was immediately put back into coma, he said, would indicate the proper course of treatment. For all the loved ones praying for Bobbi Kristina’s recovery, the recent medical setback doesn’t reveal progress either way. The only thing they can do is wait, the neurosurgeon said. “Now it’s a matter of waiting a few weeks and seeing how she’s doing. I would advise [the families] they have to stay strong, remain hopeful, give it time. Don’t lose faith. In a case like this, the younger someone is the better,” Taban said.